When the first floor was completed in the airplane hangar, a little piece of paper with a letter and number was stapled to the end of each log. One of the log guys coordinated the letters with the corners and wrote them in on the blueprint. Accordingly, a corner might have log P-1 overlapped with log Q-2 which had log P-3 above it and then Q-4 and so on. 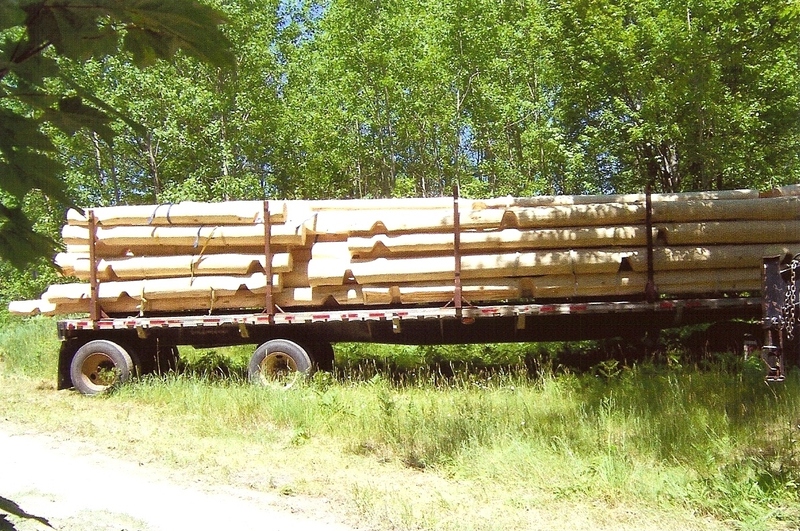 Once that was checked and double checked they disassembled the logs and placed them all on long flatbed trucks. The ones they would need first would be on top. As I told you before, our driveway used to be an old logging trail, so . . . shouldn’t a log truck be able to make the curves? Leaving nothing to chance we had the owner of the log company and his truck driver come out a year in advance to see what they thought. We wanted plenty of time to widen the tight spots or create a straighter way in. Both assured us that there wouldn’t be any problem for the experienced driver and we could keep our picturesque lane as it was. See this picture? It’s the log truck sitting off in a grassy spot at the beginning of our drive. A new and inexperienced driver had replaced the old-timer and this guy couldn’t get up the nerve to take the turns, squeezes, or the final hill. 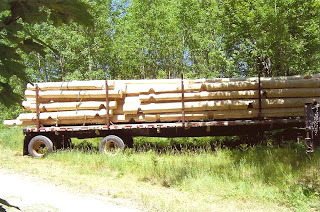 Solution: off load each log onto a smaller truck using the crane they brought with them. This killed a day, but they got the logs on site after several separate trips.